Gamers may be getting their first look at The World of Darkness MMOG during White Wolf Games' convention next month. It's been a long time since White Wolf Games made a foray into the world of videogames. The last time this happened was with 2004's Vampire: The Masquerade - Bloodlines, which was a blast, provided the many bugs didn't ruin your gameplay experience. Since then, gamers have been waiting to revisit the World of Darkness in CCP's upcoming MMOG; from the sound of things, the wait may almost be over. 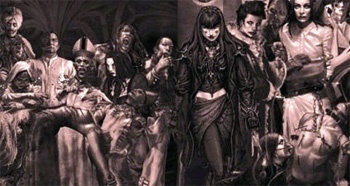 In an interview with Flames Rising, Shane DeFreest, Community Developer on World of Darkness, had some pretty exciting news for White Wolf fans who would be attending the The Grand Masquerade (White Wolf's annual convention) in September: "The big news that I can't really give to [sic] many details on is that we've got something really big we want to show our fans first. Friday at sundown is where we give everyone the first look at the future of the World of Darkness. If you have been a fan of our games for two months or two decades you won't want to miss what we have to say." CCP has been playing everything regarding the upcoming World of Darkness MMOG close to the vest for quite some time. At GDC 2009, every time I talked with developers from the company about the project, they got very cagey and were hesitant to answer even the smallest of questions. Presumably the game will be based around the revamped version of White Wolf's pen-and-paper RPG universe, though no one's entirely sure about anything more specific than that. While DeFreest's comments are by no means confirming that the MMOG will be revealed next month, it's not an unreasonable conclusion to go to. The game has a tentative release date for 2011, and The Grand Masquerade seems like the ideal situation to officially give people a first look at the title.